Life Before the Dinosaurs: Choia. Choia is an extinct sponge that lived from the Cambrian to the early Ordovician. Choia was about one inch in diameter and it looked like a cone flattened from the top, with spines radiating out the sides. 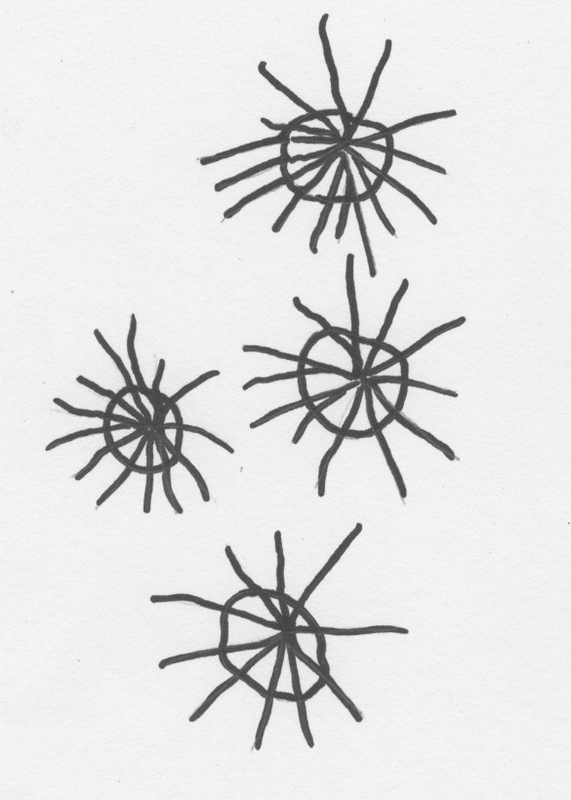 My drawing of a group of Choia on the sea floor. At first scientists thought that Choia's spines radiated out in all directions, like a sea urchin. But now they believe that Choia's spines radiated out the side. Choia lived flat against the sea floor and was probably convex so that it would not be turned over by waves and currents because it was not attached to the sea floor like most sponges. Choia lived in groups and was similar to Choiaella, which looked like a spineless Choia. 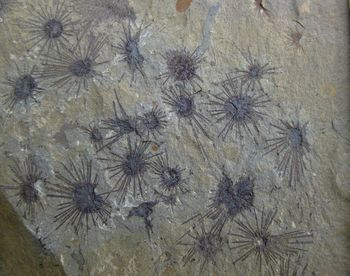 Scientists have found 127 specimens of Choia in the Phyllopod bed of the Burgess Shale. It has also been found in the Wheeler Shale in Utah, and in China, Morocco, and Greenland. I believe that Choia's spines may have kept the sponge from sinking into the soft sediment. But that is just my hypothesis. You ought to include your own illustrations more often. I agree with FlavorDav-- you should post more of your illustrations! I'm glad people like it when I post my own drawings! I just watched that video. It's really, really cool!!!!!!!!!! Thank you very much for telling me about it!!!!!!!!!! PS: Thanks for linking my blog in the sidebar!